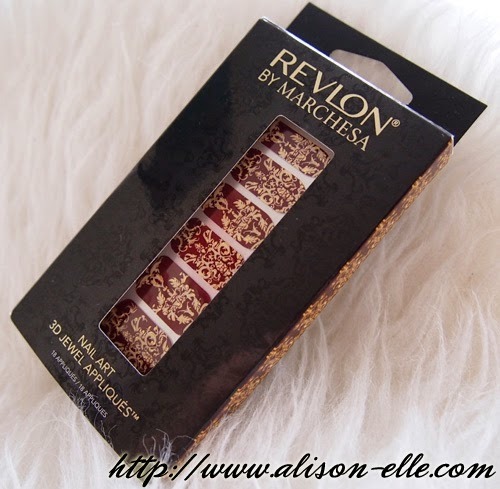 One of the beauty collaborations I'm most excited for this Fall is the limited edition Revlon by Marchesa Nail Art 3D Jewel Appliqués™ Collection, set to come out this October. Collaborating with Revlon, Marchesa founders Keren Craig and Georgina Chapman have translated their couture gowns into a set of eight intricate textured nail appliqués that I'm pretty sure many nail art addicts will want to get their hands on. As you can see, the rich metallics, intricate prints, and lavish colours are accented with opulent jewels and dainty beads. Very Marchesa and very gorgeous. Lucky for this nail art addict, I received a set of the Royal Burgundy appliqués from the #blogvancity event I recently spoke at (see recaps on J's blog and Sheila's blog) and figured that my (belated) birthday party this past weekend warranted just the occasion to wear them. I'm sure I'm not the only one who loves "special occasion nails"! Unlike the more complicated processes of some other nail wraps (example), I found applying these relatively hassle-free. All you need to do is start with clean nails, apply the stickers that fit, and file off the edges. To make the process even easier, included in each pack is a mini nail file and cuticle stick. Since I wear my nails short, I also used scissors to cut off the excess sticker before filing. With minimal work, my nails ended up looking perfectly Fall-appropriate with this beautiful burgundy and gold design inspired by this dress. I haven't been able to stop staring at them! Wear time on these nail wraps was okay but they did start showing tip wear on the second day (the overlay rubbed off to reveal white underneath). I'm not sure if this is because of my vigorous filing or not, but because the designs are so intricate it actually wasn't very noticeable. The Revlon by Marchesa Nail Art 3D Jewel Appliqués™ are limited edition and will be available at drugstores and mass retailers for $8.95 CAD. I know I'm planning on collecting a few designs... who else is with me? I don't think any collaboration with Marchesa could possibly go wrong. These nail wraps are gorgeous! I know... what I would do to own a Marchesa dress (and have somewhere to wear it)! Your nails look amazing!! Can't wait to try these out. These are insane! In a good way, of course. Can't wait for find these at my local retailer! seriously is so gorgeous! I want to try all of the designs!! Ooh, I haven't tried the ones I got at #blogvancity yet but I will soon. Yours look great! Oh wow, there are some lovely designs! I saw these yesterday at Walgreens, they look sooooo beautiful! I wish they didn't wear off so quickly though. I haven't used mine yet, but your design looks so pretty! !